Did you know that the Lake Forest Park Farmers Market opens each week with the ringing of a special market bell? And that the vendors aren't permitted to sell for the day until that bell rings? Unfortunately, the old, beloved bell was lost recently, and so the market has had to make due with borrowed bells and occasional verbal bells. “What are verbal bells?” you ask. Market folks are nothing if not creative problem solvers! But now it's time to ring in a new era with a new bell! 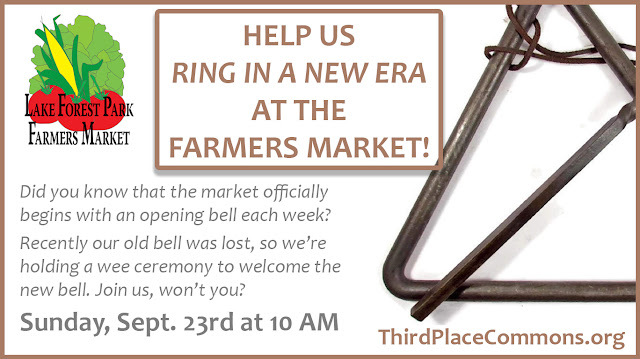 Get to the market a few minutes before 10am this Sunday, September 23, 2018 to join in a mini-ceremony to welcome the new market bell and once again start the market day with its dulcet tones. It will be a bit of silly fun and a great chance to get your market shopping done well ahead of the Seahawks game. By the way, are you wondering why the opening bell is important? The market is scheduled to open at 10Aam each Sunday, but if some vendors set-up and start selling early, then it disadvantages those who begin selling at the official market start time – and the market strives to ensure the success of all its vendors equally. Occasionally, all the vendors may be ready early, in which case the bell may ring a little early. Then everyone gets to sell before 10. But if the bell doesn’t ring, the market hasn’t opened. The Lake Forest Park Farmers Market is presented by Third Place Commons, a community-supported 501(c)(3) nonprofit organization committed to fostering real community in real space. The market takes place at the corner of Bothell Way NE and Ballinger Way NE in the parking lot of the LFP Town Center. The season runs every Sunday, rain or shine, through October 21st. See you at the market!